So you've found kittens. Wondering what to do now? 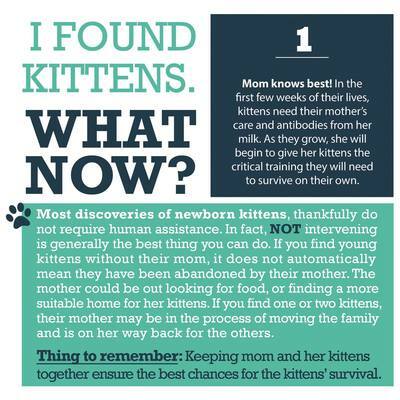 If you find young kittens without their mom, it does not automatically mean they have been abandoned by their mother. The mother could be out looking for food, or finding a more suitable home for her kittens. If you find one or two kittens, their mother may be in the process of moving the family and is on her way back for the others. Wait and observe from a distance for an hour or two. 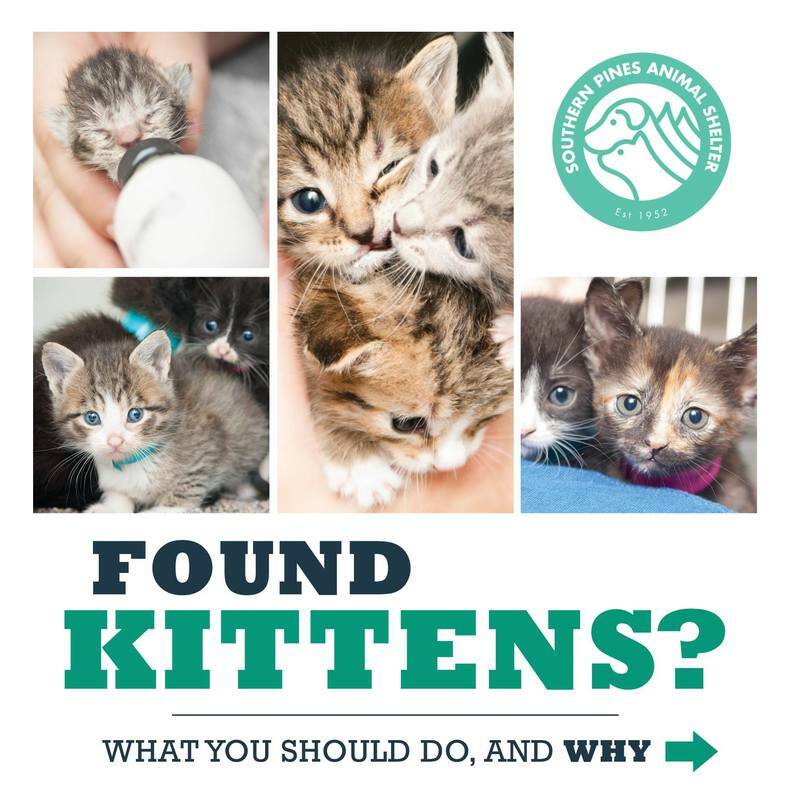 In each situation, you will ultimately have to use your own judgment to decide how to handle the kittens, depending upon the litter’s needs and your time and resources. Kittens have the best chance of survival with their mother. If you bring the cats inside you should keep them separate from your animals until evaluated by a veterinarian. 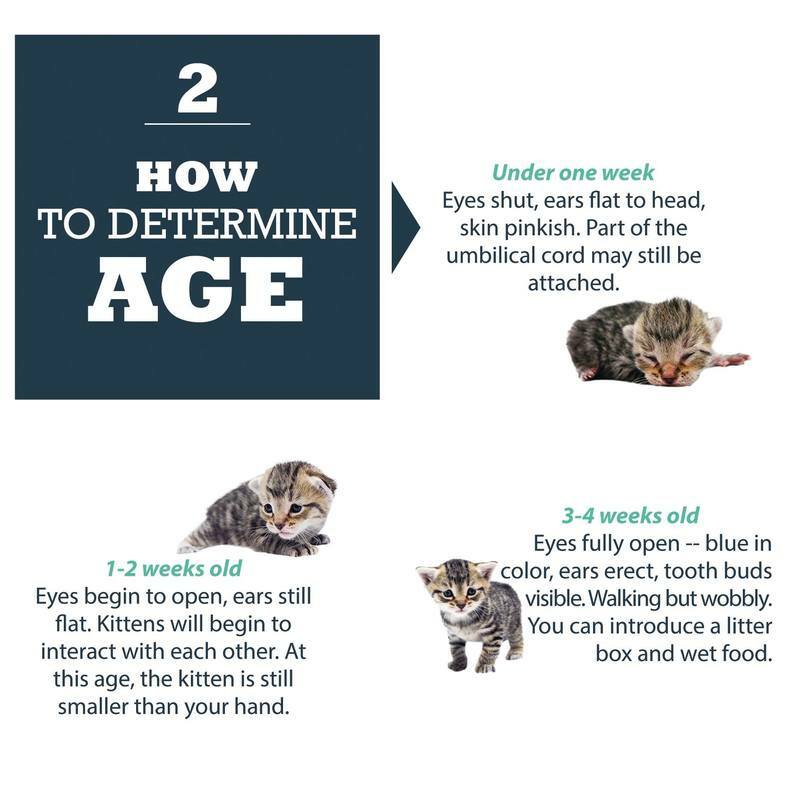 For proper social development, kittens should be kept with their litter (and mother, if possible) until at least 8 weeks of age. Southern Pines does not have the resources to feed unweaned kittens around the clock. When unweaned kittens find their way to the shelter, they must find a foster home within 24 hours. 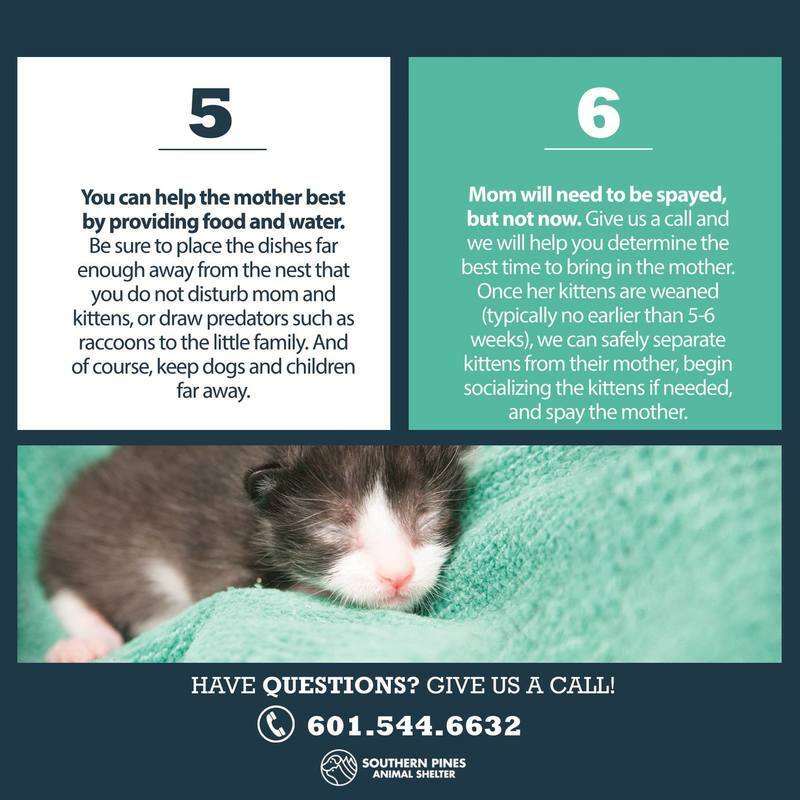 If the kittens aren’t weaned, and you take them in without a mother, they will require round-the-clock care and routine bottle feeding (every 2-3 hours, even overnight). 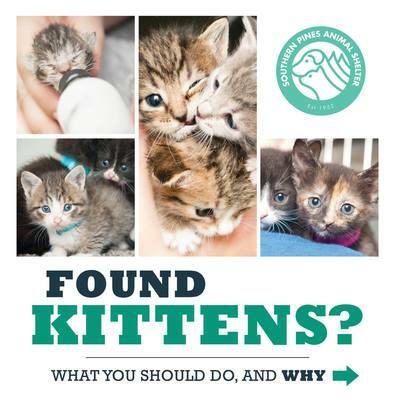 Search “how to care for unweaned kittens” and you will find a multitude of great resources to help you feed the kittens. To get you started, here is a great "how-to" with a video from The Kitten Lady. If the mother does return, and she is friendly, the best approach is to take her with her kittens indoors until the kittens are old enough to be weaned, spayed/neutered, and adopted. Momma should then be spayed and either placed in an adoptive home or returned to her territory. If the mother is feral, the family should stay outdoors with shelter, food and water provided. When the kittens are weaned, they should move indoors for socialization, and to be spayed/neutered. Mom should be trapped, spayed and returned. Kittens are old enough to be weaned around 5 weeks – when they really start to run around. For proper social development, feral kittens should be removed from their mother around 5 weeks of age, and brought indoors. Kittens from tame moms do not need to be moved from mom at 5 weeks. Under one week: Eyes shut, ears flat to head, skin looks pinkish. Part of umbilical cord may still be attached. 1 week-10 days: Eyes beginning to open, ears still flat. A kitten this age is smaller than your hand. 3 weeks: Eyes are fully open, ears are erect, teeth are visible. Kittens this age are just starting to walk and will be very wobbly. 4-5 weeks: Eyes have changed from blue to another color and/or kittens have begun to pounce and leap. Kittens this age will begin to eat gruel or canned food. When kittens are at least 8 weeks old and have been fully socialized and spayed/neutered, they (and momma, if she’s friendly) are ready for their forever home. 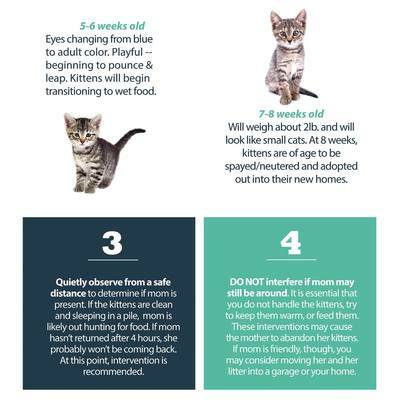 Even if you cannot keep the cats until they are 8 weeks old, keeping them until they are 6 weeks old before taking them to a shelter gives them the best chance of living. © 2018 Southern Pines Animal Shelter. All rights reserved.